Optional arms/urine splash cap attach quickly. 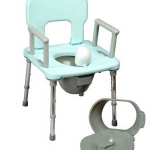 This multifunctional portable shower / commode chair is great for travel, camping, visiting family. 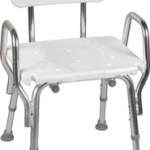 It easy to assemble legs and back snap in place and can be put in luggage during traveling.